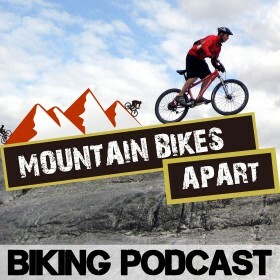 The latest edition of the MountainBikesApart podcast is here. In episode 6, Tom talks racing, becoming an Elite/Pro cross-country racer, we answer another great listener question and we have another audio comment sent in to us, which always gets us excited! Tom headed off to Portugal recently to tackle the first race of the 2017 season, a 3-day UCI stage race event called the Algarve Bike Challenge. Kicking off with a short evening time trial and then featuring two long stages of 90KM and 75KM over the next few days, it was a test both speed and endurance over some hilly terrain. Sticking with the racing theme, Colin and Tom discuss what it means to be a “pro” cyclist and mountain bike racer and the struggles of trying to make it in a highly-competitive but niche sport. Tom discusses the UK scene and the challenge of balancing training and racing with other forms of income, as well as talking about some of the ways to make it as a pro. As a loosely defined term, it’s interesting to learn about how different athletes make it all work. Tom also talks about how training for XC racing on a full-time basis evolves throughout the year and what a week of training typically involves. We received some great feedback from a listener called Nancy Kim around the single speed topic we discussed on a previous show, which really shone more light onto why different riders choose to go with one gear. Nancy points out that for certain types of riding, the simplicity and fewer damageable parts on a single speed bike far outweigh the benefits of having gears. This includes dirt jumping and other such disciplines. It’s worth noting that she makes the point that gears are great for general mountain biking and that whilst she uses a single speed in some applications, she prefers to have a geared bike the majority of the time. Do you ride a single speed? If so, we’d love to hear what your reason is for choosing to go single speed! Finally, we dive in to another intriguing listener question and try to offer our best advice. This one comes in from Daniel West, who’s asking about converting to a 1x system. He wants to only change one or two components on the bike and asks us if it’s possible. As you’ll hear, Colin and Tom talk about the issues around going to a 1×10 or 1×11 system and the pitfalls of trying to bodge it. Ultimately, the advice to Daniel is to do it properly and spend time saving up to get a full groupset, since there are lots of deals to be found on 1x specific drivetrains. Have you recently converted to a 1x setup? Or have you started racing recently and are wondering how to get more serious with your preparation? We’d love to hear any questions or comments you have about this show or anything mountain biking, so make sure to get in touch with us via the website. We’ll see you on Episode 7 – happy riding until then!